After the 2011 tsunami in Tohoku, Japan, anxious eyes have peered towards the shores on the other side of the Pacific- Alaska, Hawaii, British Columbia, and the US continental Pacific Coast. However, for those who were caught in the epicenter of the disaster, this turning away is perhaps the worst thing. More than two years after the events of March 2011, Japan is still struggling to establish a normalcy that has been severely disrupted by natural disaster. 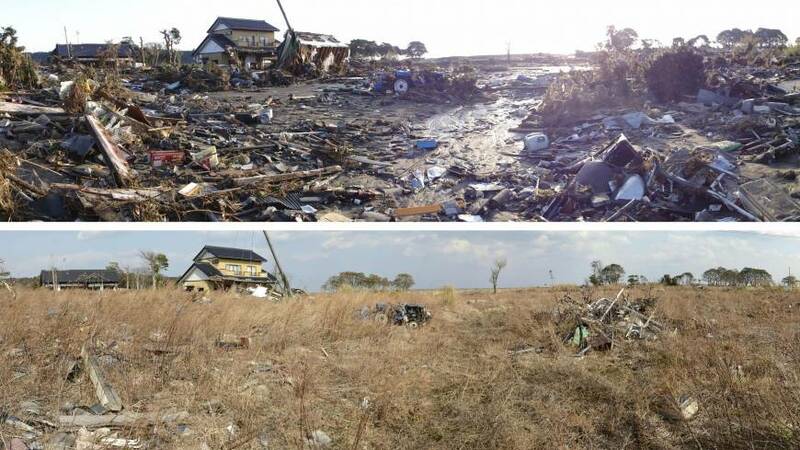 Recently, the Miyagi prefecture- where a majority of the damage occurred (Along with Iwate and Fukishima) - established a 10 year recovery plan to cope with the millions of tons of debris from destroyed architecture and other objects. Iwate and Miyagi together still have over 600,000 tons of debris left to clean up. However, due to recent decreased estimates in the amount of debris, many fear losing essential funding that is being allotted for such efforts. One town in particular- Ishinomaki, has an especially large amount of debris. The Jakarta Post reported the deputy chief of the reconstruction policy bureau stated the debris came from the remains of 53,742 damaged structures. He also stated that that volume of debris would take over one hundred years to accumulate as 'waste' at a natural rate. 1: Debris is separated into 'rough' groupings- such as timber, building materials, appliances, etc. and trucked to corresponding waste management facilities in a nearby establishment- more than 14 prefectures have offered services for disposal, despite initial concerns (since calmed) that the debris may be radioactive. 2: The debris is then loaded onto conveyer belts, where the debris is separated into combustible and non-combustible materials. Combustible materials are incinerated. 3: Non-combustible materials are further sorted an disposed of as necessary. More than 1/3 of debris has been cleaned up, but some are still not satisfied with the level of progress thus far. In addition, recovery efforts have been slowed as many have moved inland to seek further employment. Those remaining are being employed to the best extent in the cleanup. Businesses that were affected by the disaster are doing their best to recover. An interesting case noted by the Jakarta Post was that of a fish cannery. The cannery's president, Nigato Kimura, was determined to save his product. More than 400 of his cans of fish product were buried, and Kimura and his workers spent months recovering the cans, which were then sold both to restaurants and those who wished to support his business. Kimura is a fortunate example of an impacted business- in general, victims of the 2011 disaster- including entire villages - completely lost their livelihoods, as well as all possessions. The earthquake and tsunamis that occurred caused massive nuclear disaster at the Fukishima Daiichi Nuclear Facility, in Fukishima Japan. As a result, nuclear radiation was leaked from the facility both purposefully (to prevent potentially hazardous gaseous buildup) and due to containment failures from physical damage and power failures. Radioactive material continued to leak throughout 2011 and 2012. Read more about the details of the disaster in my Nuclear Impacts Part I and II posts. On the International Nuclear Event Scale (INES), Fukishima is the second event only - after Chernobyl - to be rated a 7 out of 7. A spectacular image of the containment process at Fukishima, shortly after the disaster. A full size photo can be found here. On a biological scale, the radiation levels appear to be surprisingly low. Higher levels of radioactive contamination have been noted in nearby fish or birds, but farther away from the disaster zone, results are more modest. However, part of the problem comes from the question of how to categorize 'safe' levels of radiation. We are all bombarded by a background level of radiation on a daily basis, but it is when the ratio of radioactive particles relative to non-radioactive particles becomes to high that we are in danger. Interestingly, the general levels of radiation remaining around Fukishima are certainly higher than they used to be, but they are still lower than the background radiation levels in other parts of the world, such as Kerala, India- one of the locations with the highest background radiation levels in the world. At the end of 2011, Fukishima was rated the #1 most radioactive location on Earth- this is certainly no longer the case. There is much ahead for Japanese government as they perform risk assessments, cleanups, and decide what levels are truly environmentally safe. It will be a long time before permanent impacts, if any, are a consideration. Outlooks appear to be optimistic, however they should not deter from the urgency of cleanup efforts that are currently taking place. OSU's chart of radioactivity levels across the globe. 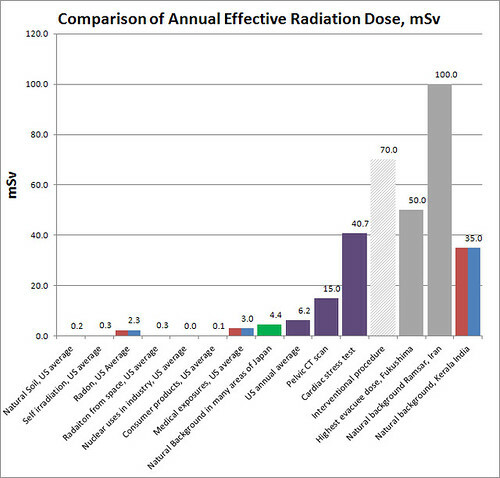 Note that Ramsar, Iran exceeds Fukishima's highest evacuee dose- the amount of radiation found in an individual who was evacuated from the area.